A Complete Alphabet of Eine's Shopfront Shutter Graffiti Letters, originally uploaded by Dave Gorman. So goes the NATO phonetic alphabet. But ever since I started making plans with my friends Charlie, Juliet and her papa, Oscar to spend November in India where a company called Alpha Travel were offering us a great deal on a two week holiday learning to foxtrot and tango with some golf on the side and a free kilo of whiskey for everyone who books early it's been causing us no end of confusion. Especially when the crackly phone line between me in London and them in Quebec means I have to keep spelling things out to them. So I've decided to come up with a new phonetic alphabet. I think there's much less room for confusion with mine. I expect it'll soon become the international standard. ... seriously, originally uploaded by Dave Gorman. I'm enjoying the Sunday morning radio show immensely. I think we clicked pretty quickly as a team on air and off but even over the space of three shows I think we've gelled more, which means that while we've increased the amount of content to each show they've also sounded increasingly relaxed. To my mind the podcast is worth listening to just to hear Martin's musical contribution at the end. To have all your e-mails and texts summed up in song by the end of the show seems like a remarkable gift to me. I don't know how he does it. To really ram home how musical he is, he's performed the song on a different instrument each week so far. That's just silly. I can never remember all the e-mails and texts we've received during the show so there's always a moment during his song where I suddenly think - "oh yeah... there was that one too!" I'm pretty sure he's actually getting them all in. Of course that's only one of the ways you can get involved in the show. Some of the jingles we've been sent in have been superb. There seems to be a nice steady trickle of them now - but do keep them coming. Of course there are loads of other ways you can get involved in the show. For instance, there's always a talking point that we encourage you to contact us about. The story we heard this week - from a man who'd been going out with a girl for 5 years without knowing she wore false teeth was a classic. Oh... and if you don't listen live but do get the podcast don't go assuming that you can't join in. If you're listening and thinking, "Oh... I would have told them about the time when I...." then send us an e-mail. We'd like the podcast listeners to feel involved too. Here's the link to the podcast on AbsoluteRadio.co.uk And of course, it's also available on iTunes. There have been a record number of complaints about Jan Moir's frankly horrible article on the death of Stephen Gately. It seems impossible to imagine anyone having access to the internet and not having read (and read about) the article already so I won't bother to go over the details again. There's nothing new to add really. 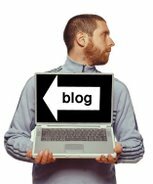 I suppose it's possible that someone somewhere has just come out of a 4 day coma and so knows nothing about it and while it's stretching credibility a little to imagine that my blog would be their first online port of call, I suppose it is possible. But rather than repeat things that have been put better elsewhere I'll simply direct you to Charlie Brooker's words instead. (If you can stomach it and want to check for yourself that things haven't been blown out of proportion you could also read the original article (and its sanitised headline). In a statement responding to the shitstorm of criticism, Moir says, "In what is clearly a heavily orchestrated internet campaign I think it is mischievous in the extreme to suggest that my article has homophobic and bigoted undertones." I don't know where to start with that. Highly-orchestrated-campaign or denial-of-homophobia? I'll toss a coin. Right. Denial-of-homophobia it is. In her defence she points out the nice things she said about him... as if pointing out that someone was "sweet" and "charming" in some way makes it okay for you to speculate about the nature of their death and present your sleazy speculation as fact with no regard for how your words will wound those who are mourning. "Another real sadness about Gately's death is that it strikes another blow to the happy-ever-after myth of civil partnerships." Really? Was there a myth about gay people living forever? I don't honestly see how someone dying a tragically early death from natural causes strikes a blow to any other kind of myth. Unless the suggestion is that his sexuality is connected to his death and that no married, straight person could ever suffer a similar fate. And seeing as that's factually inaccurate, it's, y'know, homophobic. No matter that you also thought he was sweet and charming, Jan. In summary, when I read Moir's article, I took it to mean, "Sweet, charming, gay man dies because he's a sleazy, sordid gayer!" Now, on to this strange idea that she's a victim of some kind of orchestrated campaign. I take offence at the idea that my offence - which feels kind of real to me - somehow doesn't count because I heard about the article online. All those people complaining are just doing it because they want to join in. Yeah! Yes. And Marks & Spencers pulled their advertising from your page of the website and Phillip Schofield hoped you went to bed feeling ashamed because, as we all know, they're as far removed from public opinion as anyone could ever be. It's not like the host of This Morning and the nation's favourite underwear supplier are any kind of barometer. More pertinent still is that it seems to be kind of ridiculous for anyone from The Daily Mail to be complaining about any kind of "campaign" when running such campaigns is what they seem to do best. They seem so very happy when they're the ones waving pitchforks, rallying the mob, gleefully gloating about the number of complaints the BBC has received over the Ross/Brand affair, say, or stoking the fires by making ridiculous claims about the number of swear words used in Jerry Springer: The Opera but when the mob is gathering outside their door, one of their writers stamps her feet and yells, "Not fair!" It's not even as if there is a campaign. Certainly not a highly orchestrated one. I've a friend who's a vicar. He saw Jerry Springer: The Opera. He loved it. He was vaguely troubled by one line but found its merits far outweighed that one moment of glibness. He was concerned when a petition arrived at his church encouraging people to complain about it. He was the only person in his congregation to have actually seen the show. Ignorance of the show's content didn't stop people signing the petition. And that petition was being sent to hundreds - probably thousands - of churches. That's a highly orchestrated campaign. That's people complaining about something they haven't seen. But that's not what I witnessed online on the day of Moir's article. What I saw was lots of people linking directly to the article, in much the same way that I've provided links to that - and other articles - in this blog post. It's pretty obvious what I think about it but it's also perfectly possible for you to read the article and form your own opinion. That's not a highly orchestrated campaign. That's just the internet being good at being the internet. Things take off. Words get spread. Word of mouse they call it. I'll bet that the vast majority of people who've complained about the article have read it and that their offence is real. But here's the rub. While the Mail likes to complain about broadcasters, they're also subject to completely different rules. I thought about this a while ago when the Scottish Daily Express ran a truly despicable article about the now 18 year old survivors of the Dunblane massacre. It was during online discussions about this article that I discovered the Press Complaints Commission has no obligation to listen to complaints that come from anyone other than those directly affected by the article. If you think a broadcaster breaches taste or decency you can complain to Ofcom. That's an independent body. The broadcasters have to abide by a code of conduct. Ofcom can punish them if they breach it. If you think a newspaper breaches taste and decency you have nowhere to turn. Unless you or your family are the subject of the article in question. The Press Complaints Commission isn't an independent body. The chair of the PCC Code Committee is Paul Dacre. He's also the editor of The Daily Mail. The idea that the man who has to take ultimate responsibility for the printing of Moir's article is also chairing the committee that decides what rules he has to abide by seems utterly ridiculous. Especially when an article as tasteless as this (in content and timing) has been printed. As it happens, it looks as though the PCC will still act in this instance regardless of whether any of Gateley's family complain. I hope they do. But I can't help thinking that if they do it will have less to do with doing the right thing and more to do with protecting their privileged position of self-policing. While their rules don't oblige them to listen to 21,000 complaints, to ignore them would be ridiculous... so ridiculous that it might lead to renewed calls for an independent regulatory body for the press. In the heat of the moment it would be nice to see Jan Moir made an example of but in the long term I'd rather our press were forced to play by the same rules as our broadcasters. If they were it might not have happened in the first place. 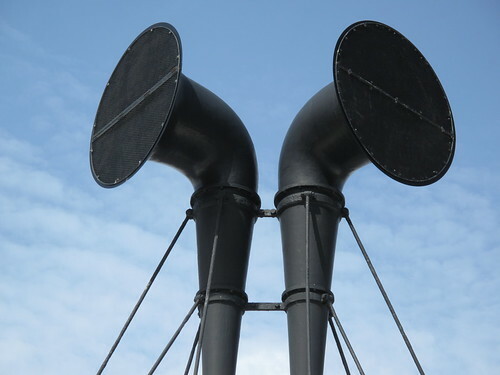 Foghorns, originally uploaded by Dave Gorman. I took part in a recording of two episodes of Radio 4's Just A Minute yesterday at Derby University. That's the third time I've done the show - having done two episodes a while ago in London and a single episode at Hay on Wye last year - and it remains as damnedly difficult a game to play. It felt like I spent the whole of the first show pressing my buzzer and trying to challenge only to discover that I was pipped to the post by my fellow contestants. Early on there were plenty of times when I'd be sitting there thinking, 'oh good... I know exactly how I'll handle this subject' - but every time that was the case, I'd be unable to mount a fast enough challenge. After a while I stopped trying to think about what I would say if I got in and suddenly, I found myself faster on the buzzer and occasionally able to steal the subject. Next time I play - if there is a next time - I'll do no thinking at all and just let my thumb buzz when it wants to. It was a hugely enjoyable evening with a lovely, fun audience. Tony Hawks, Josie Lawrence and Justin Moorhouse were all on fine form... you only have to add the remarkable presence of Nicholas Parsons to the mix and it transforms into something quite special. This is Martin, Danielle and myself celebrating after our first show together on Absolute Radio. We weren't just celebrating our first show... we all had something individual that's worth celebrating and it says something about the confessional nature of radio that words slipped out on air that I would be nervous of typing here. The work/life separation feels more blurred on the wireless for some reason. I reckon it was nice and relaxed for a first show and while I'm sure things will get smoother here and there I liked its rough-around-the-edges feel. Martin's song at the end - summarising the e-mails and texts that had come in over the two hours was really something to behold. Amazing really. The listeners do as much to define a station as anything else so seeing so many texts and e-mails come in really did make us feel very welcome. Thanks all. It wasn't just messages either... there were a few jingles made by listeners too. Thanks to Jerry Mandarin (nice jingle, surely not a real name... gerrymandering... hmmm), David Wilks (very bizarre, that one) and Tom White (made us laugh each and every time we played it) for those. We have some more that we haven't heard yet and we'd love it if you kept them coming in. It set a really nice tone for the show. If you're not a Sunday morning kind of person, the podcast is up already. 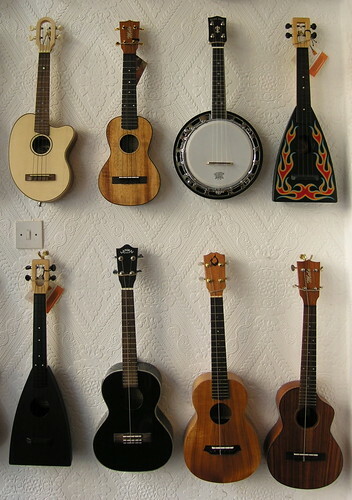 8 Ukes and a Light Switch, originally uploaded by Dave Gorman. We'd really like the show to be as interactive as possible... and we thought one way of getting people involved would be to invite our listeners to contribute jingles. I really like the idea of having some homemade jingles and it would mean the show's tone of voice would - in a way - be set by the people who listen to it. We haven't got any particular purpose in mind, just a generic show jingle... so anything that works for an Absolute Radio show presented by, um, me would be dandy. Now this may be a longshot - and we might get nothing out of it - but at the same time, there must be some musically minded people out there who'd enjoy the idea of writing and recording something nice and short and, um, jingle-y. send us an email instead. 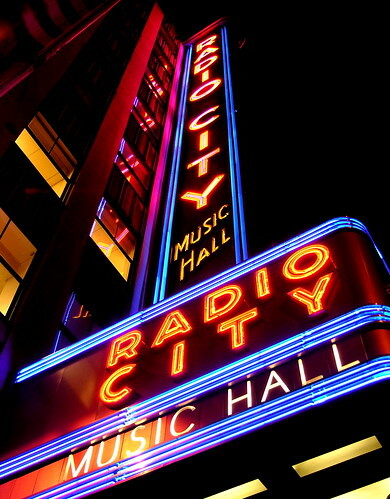 Radio City Music Hall, originally uploaded by Dave Gorman. It's taking me a while to adjust to life after the bike ride. My body was shocked for the first week and a bit of intense exercise and now it seems equally shocked by the fact that it's ended. I have to be careful - I'm still eating like a man who's cycling 50 miles a day. I could undo all the good work I've just done in a very short space of time. I was concerned that going straight into a new project wasn't going to be a good idea but as it goes, our first meeting about the new show on Absolute Radio really helped to draw a line under the tour and the cycling. Finding myself being all excited about what I'm about to throw myself into was actually the best way of throwing off the shadow of what I've just experienced. I'm going to be presenting a show on Absolute on Sunday mornings (10 til 12) starting this week and it's really exciting starting with a blank piece of paper and building from there. I say, 'we' because the first thing we've added to the mix is a couple of co-presenters in the shape of Danielle Ward and Martin White - both of whom are excellent and funny and - most importantly - highly distinctive and definitely not cookie-cutter you-know-what-you're-going-to-get kind of stand-ups. I'm really looking forward to it. We'd like to make the shows as interactive as possible so do pop along to the show's page on the Absolute site and get in touch - especially when we're on air. I did read through the comments left on the post I made on Day 33 (both here at gormano.blogspot and on facebook where the blog is automatically imported) and I don't mind admitting that it wasn't long before the wave of warmth and support had me shedding a lovely tear. Thanks all. But what was against us was the weather. It was raining heavily and the wind was raging... and Caithness is so flat that when the wind gets up there's really nothing to get in its way. If we'd have been doing the ride 24 hours later we'd have had 80mph winds to contend with and that might have meant it was impossible. I hadn't planned on having a Human Sat Nav for this ride. I figured it would be a weird thing to share with a stranger. I knew that completing such a mammoth task would have an emotional impact on me of some sort and it would be odd sharing that moment with someone I'd only just met and had only been with for an hour and a half or so. I also knew that I didn't need to have anyone show me the way... it's not as though there are several roads leading to Dunnet Head. But I did have company. In the shape of The Delightful B. I knew she was coming up to see me at the end of the journey... but I really wasn't expecting her to volunteer to share the final ride with me. It made perfect sense. There's nobody else better placed to understand the way I'd be feeling at the end of this thing and nobody I'd rather share it with. I told you it was wet. I'm so proud of the last month. At times it's been harder than I thought but I've come through it in better shape than I imagined I would. 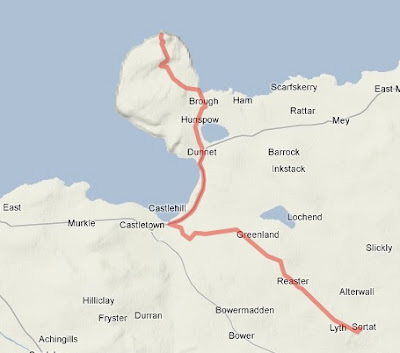 Whenever I spoke to people who'd done long rides - Lands End to John o' Groats for instance - they all said the same thing; "when we got to our B&B, we had a bite to eat, one pint and then fell asleep." Nobody ever talked about doing 4 or 5 hours of energetic work at the end of the day but that's what I managed to do. Doing the shows was the untestable part of the whole venture and I can't quite believe that I made every show on time and got through them all without much of a hitch. This was always going to be a strange tour and because of the unusual nature of what we were doing Ed was taking on far more than the logistical and technical duties of a normal tour manager. 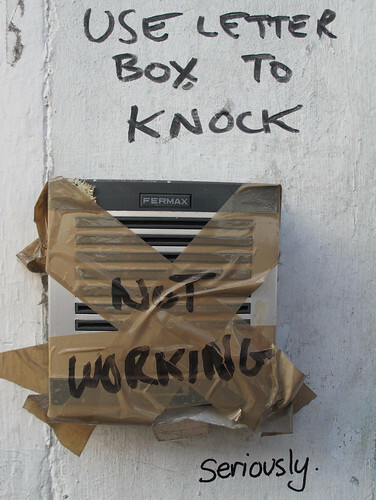 Normal service will be resumed soon. In the mean time... someone's told me that there's someone pretending to me on Reddit.com. One thousand, five hundred and sixty three! That's how many miles I've cycled. From the southernmost point of the British mainland to the easternmost point to the westernmost point to the northernmost point. With a full show each and every night along the way. I'm exhausted. I'm also exceedingly proud. There's not much of an internet connection here so I can't offer pictures or maps or whatever but I'll catch up when I'm back in London. I'm going to take a couple of days off before that happens though. Lots to sit and think about. It's been an amazing month - the most exhilarating of my life - big thanks to everyone who came to a show (no spoilers now, it tours again in the spring!) and to everyone who's offered encouragement along the way. It's been much appreciated.